Samsung reveals its newest slim external 3D Blu-ray drive, the SE-406A which is USB powered, eliminating the need for an AC power adapter. 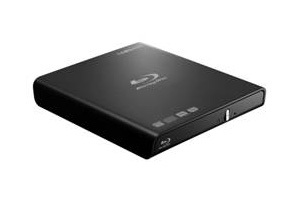 The drive is capable of transforming 2D DVD movies into a 3D and of course can reads Blu-ray discs and writes CD/DVDs. The SE-406A has sleek, anti-fingerprint surface, features Buffer Under Run technology to prevent errors that may result from writing speeds that exceed data transfer speeds and comes with CyberLink TrueTheater software to test PC readiness for 3D and Blu-ray content. The drive offers following read/write speeds: 6X BD-R, 4X BD-R Dual Layer, 24X CD-ROM, 24X CD-RW, 8X DVD±R recording, 8X DVD-RAM recording, 6X DVD+R Dual Layer recording, 6X DVD-R Dual Layer recording, 8X DVD+RW recording and 6X DVD-RW recording.